← Why Do We Grow So Much Corn? I was really impressed with American Meat. The documentary was more ambitious than I would have guessed. It was fair and not myopic. Graham Meriwether (the director, cinematographer and producer) anticipated his critics and really gives us a complete (as much as can be in one documentary) picture of the current problem with our food system. 1. “Food connects us all” — I agree 100% and that’s why I believe wholeheartedly that “food activism” or whatever you want to call it is absolutely necessary because food is such an important part of every day of our lives. I remember learning in grade school that there were some basics to life: food, shelter and clothing. Food is top 3! Now obviously there are other aspects of life that are absolutely necessary as well, but food certainly connects us all in meaningful ways. When you think back on your life it’s a good bet some of the best family times involved food. 2. “We’re so removed from our food…” — The vast majority of Americans get their food at a restaurant or a grocery store. The reality is the grocery store is several if not several dozen steps removed from the actual place where your food came from. Do you know how the chicken that ended up in your saran wrapped package from the grocery store was killed? Would you be willing to find out? I’m not saying that killing a chicken is inherently wrong or immoral. Far from it. However, it’s important to realize that chickens are thought of as “protein units” in an industrial system that values bigger, better cheaper over all else. The chicken slaughterhouse is a unlike anything you’ve ever seen. Imagine an unending conveyor belt of chicken carcasses whizzing by all day long. Imagine you’re a worker on that line and you have worry every day if today is going to be the day you slice off your finger or have to be sidelined from work because of a repetitive stress injury. Virtually no one thinks about this when they buy chicken at the supermarket or order chicken strips at the restaurant. Read more about poultry production here. We literally have no idea where our food came from in most cases. The box or package doesn’t show the whole story. 3. Cost is a major problem — I’ve seen this scenario a dozen times: You nearly run out of breath telling someone the whole truth about factory farming and they respond “but no one can afford what you’re talking about, millions would be unable to afford that kind of food system.” This is one of the biggest issues in transitioning from a factory farming system to a sustainable farming system. I’d like to make three brief points: 1) We’re unfairly subsidizing the factory farming system so that the true costs are not reflected in the end product. Also, read this piece by Marion Nestle. 2) We should really be concerned about how a lot of people don’t make what would be considered a “living wage”. We should be concerned not just about making food affordable but making people able to afford food. 3) Factory farming is an unsustainable system and we literally have no choice but to convert to sustainable farming in the near future or we’ll really be in trouble. What I’m trying to say is factory farming is essentially connected to a barrel of oil. If we’re concerned about getting America “off of foreign oil” and thinking next-generation with our vehicles (electric, fuel cell, etc.) then we should really be thinking next-generation sustainable farming. 4. “Know your farmer and just completely opt out of the system” — quote by the hilariously spot on Joel Salatin. He’s a “character” is what my Grandma might say. Joel asks “if you could get paid a nice wage for working with your hands doing something that was healing would you give up your globalist agenda Dilbert cubicle job? A lot of people would.” I think that’s a beautiful statement. Have you ever gone outside and worked with your hands and had that sense of satisfaction of a job well done. I know you know the feeling. It’s a great one. Joel is basically saying you could make a living out of that feeling and do a world of good at the same time. The need is there and now we need the warm bodies. I was inspired by the number of new farmers chronicled in the documentary. I was especially impressed with one middle-aged man who gave up his 100K a year salaried job to be a delivery man for a farm (I believe it was Polyface farms, Joel Salatin’s farm) and how much better his life has been as a result. 4. We’re going to need more farmers — I think that’s good news. American Meat basically tells us to follow the advice of Ghandi himself and “be the change you wish to see in the world.” If we transition to sustainable farming we will need more farmers. It’s as simple as that. Today’s “get big or go home” farming manifesto doesn’t need a lot (relatively speaking) of labor on the farm. When you take petroleum out of the equation you must replace that with the physical labor of people on the farm. Over the past several decades we’ve seen a decay of small town America and the small sustainable family farm is nearly extinct. The average age of a farmer today is 57. We need young people to aspire to be farmers. We need to show young people that something exciting is happening out on the farm and they should be a part of it. Assignment: Watch the trailer for American Meat below. 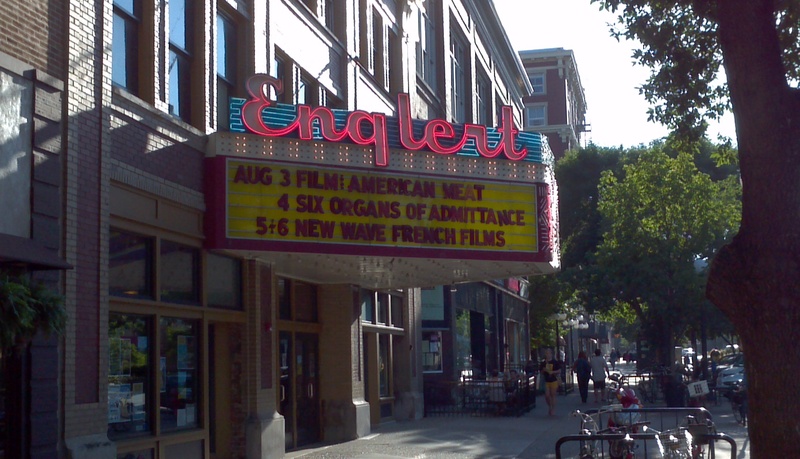 Then visit the website http://www.americanmeatfilm.com and look for a screening near you. If there’s no screening near you, request a screening.